The Burkean's rebrand this year has been matched by an ominous shift away from conservatism and into populism, writes Matthew Murphy. Considerable publicity surrounded the launch of the Burkean this time last year. The announcement of a student publication backed by the godfather of Irish conservatism, Declan Ganley, immediately captured students’ attention. While newspapers, The University Times included, instantly went on the attack, with Trinity News describing the paper as a “useless addition to the world”, the reaction on the part of students at large was more nuanced. Some were bemused. Some were actively angered. Some, like me, were intrigued. The paper’s pledge to be a voice for conservatives on campuses seemed an interesting, if challenging, goal. And for a time the paper, with some notable exceptions, seemed to at least attempt to meet that aim. Its content didn’t always strike the right tone, and some of it did appear to actively court controversy for publicity’s sake at times, but broadly speaking the articles were generally argued in good faith, seeking to strike an impassioned but reasoned balance. The publication, by virtue of its determination to represent such a broad spectrum of conservative voices, was always playing with fire. It was forced to tread a fine line between giving a voice to genuine conservative ideas and preventing a platform to those reactionary elements that have increasingly infiltrated the right worldwide. For a time, the paper succeeded in that goal. However, since the appointment of Michael O’Dwyer Connolly as Editor of the publication at the beginning of this year, readers of the paper will have noticed an ominous shift in the paper’s tone and direction. Gone are the more traditional conservative ideas, shunted firmly aside in the paper’s quest to reshape the modern definition of conservative. Free trade and libertarian views, staples of conservative politics, have given way, replaced by conspiratorial pieces that pander to the fear of George Soros, long the arch-enemy of the ardent nationalist. Most recently, the paper has published bafflingly conceived defences of Peter Casey’s conduct during last year’s presidential election and condemned the Good Friday Agreement as nothing more than a tool in the pursuit of a “globalist state”. This shift is more than just an expansion in terms of content. The paper now regularly finds itself fanning the flames of Irish populism, a cruel diversion from its original desire to be a champion of compassionate conservatism. Under the direction of O’Dwyer Connolly, the paper has published pieces that defend the merits of populist parties in the vein of Alternative für Deutschland in Germany and the Lega-Five Star coalition in Italy. In doing so, the paper has wilfully ignored and refused to even engage with the legitimate criticism of these parties and their troubling attitudes to migration and the rule of law, and perhaps most troublingly in the post-Brexit era, the threat they pose to the future of the European cooperation. Instead, it draws on eminently troubling phrases like “taking back control” and “identity and nationhood” as a rallying cry for its support of these parties. In an Irish context, the paper has unthinkingly promoted a succession of nationalist parties, extolling the virtues of populist groups such as the Irexit Party. One of the publication’s more troubling pieces would be charitably described as free publicity for the National Party. Let’s be clear: these parties celebrate no brand of conservatism, only chaos. This ominous shift towards becoming the voice of a small, but increasingly vocal and dangerous, section of Irish society has long been clear to those paying attention. Read between the lines of the Burkean and familiar tropes quickly emerge. Buzzwords and stock phrases made infamous by the American alt-right have found themselves included in the Burkean’s output, with warnings of globalism increasingly becoming the norm of late. Indeed, O’Dwyer Connolly himself has become something of a fixture of the Irish far-right himself. 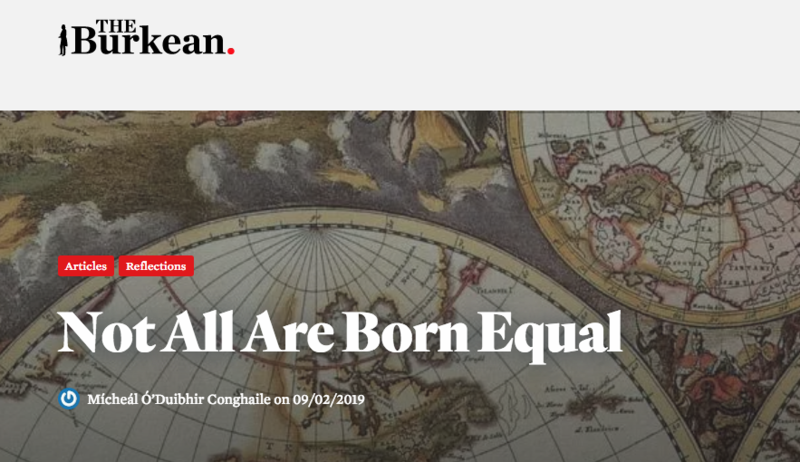 However, the publication on Sunday of an article titled “Not All Are Born Equal” is the most overt indication yet that the Burkean has moved beyond its foundational motive as a project for frustrated right-wing students, confirming its status as an altogether more troubling publication. The article in question, which purports to examine the reasons for the comparative economic disadvantage suffered by African nations, frequently slips into implicit endorsements of eugenics. Arguing against an “egalitarian understanding of humanity”, O’Dwyer Connolly attributes the inability of third-world nations to escape the cycle of poverty to “genetic inheritance”. More troublingly still, the article credits Anatoly Karlin, a well known member of the Russian far right who has appeared at events alongside American white nationalist Richard Spencer, as the source of many of the ideas expressed in the piece. Its argument is unabashedly racist, and the attribution of the ideas espoused in the piece to Karlin betrays the troubling ideology that now influences the paper’s content and outlook. It has, quite rightly, been roundly condemned by a host of figures on the Irish right, from Declan Ganley to John McGuirk, over the past 24 hours. In publishing such an article, the Burkean has abandoned any claim it once had to being a legitimate voice for conservatives. The paper has aligned itself absolutely with the far right. Perhaps the most troubling aspect of this incident, however, is the large groundswell of support that has emerged for the piece on twitter. Condemnations of the piece have been dismissed by many as attacks on freedom of speech, while McGuirk has been accused of betraying the Irish right. The piece has emboldened Ireland’s alt-right. The editors of the paper have always been consistent in their pledge to be the cheerleaders of conservative voices from across the spectrum. If this is a laudable goal, however, then it’s important to make clear: advocacy for populism isn’t a defence of conservative ideas. It’s an aberration of them. It must surely be argued, therefore, that the duty of editors in a paper such as the Burkean is to ensure that the direction of the paper is defended, its original purpose preserved, rather than to facilitate the increasingly negative and contrarian views that have become prevalent in the publication of late. In the modern era, it can be difficult to draw the line between conservative and populist views. It is an issue that the Republican party has struggled with in the US, and one that will no doubt raise its head in European politics. The Burkean has already battled – and lost – on that issue. While its recent rebrand, to the snappier sounding Burkean, represents on the surface only an innocuous modification, it came alongside a more profound shift away from the ideals of the man from whom it takes its name. This weekend’s article is the culmination of a long term project in the Burkean, and with its completion the paper appears to have cemented its status as a mouthpiece of the Irish far right.